The Swords of Ditto Coming To PS4 And PC | Nerd Much? Devolver Digital has announced that The Swords of Ditto will be arriving on the PS4 and PC in early 2018. The game will be included in their demos at E3. 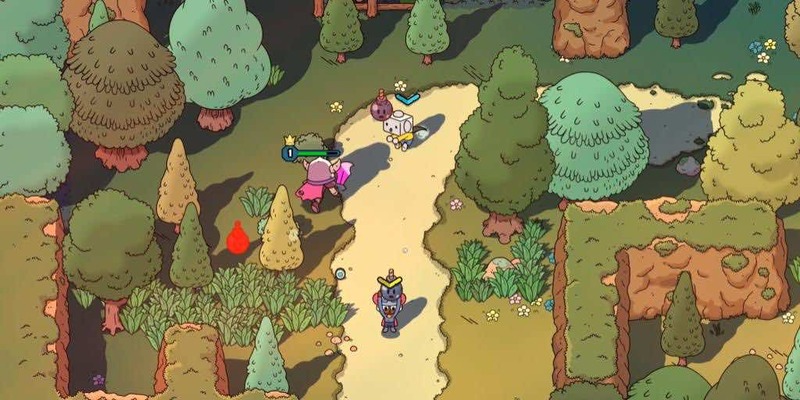 The Swords of Ditto is an action RPG in top-down mode with cartoon graphics clearly inspired by Steven Universe. Each player will have a unique experience on their quest to fight the evil Mormo. The main feature of this game is the local co-op mode. There is a single player mode, but the fun is definitely in the co-op. You can go through the entire world together, from dungeons and villages to the the main boss Mormo. And it’s okay if one of you dies, the revival hug will get you back on your feet in no time. With so few games out there being couch co-op, The Swords of Ditto looks like a good time and worth checking out in the future. Indeed, it feels a bit like Tri Force Heroes, only without all the nonsense of having to find three other friends. And of course more combat and less puzzles, and way better communication. Other features include distinct quests, implications for the player’s actions (mostly to do with weapons and loot), weapons can range from sword and bow, to Frisbee and golf club; stickers are also featured, helping to give the player certain perks to gear and their character. The Swords of Ditto arrives early 2018 on the PS4 and PC. Yet another game I wish would come on the Switch as well.